So as you may have heard, quarterback Russell Wilson has set an April 15 deadline to get a new contract from the Seahawks. But maybe you wonder what that means? Why set a deadline? And where do things stand now? Consider this a one-stop question-and-answer shop at addressing and updating all the relevant issues. Q: Why did Wilson set an April 15 deadline? A: Wilson, recall, has one year left on a four-year, $87.6 million deal signed in July 2015, which, at the time, made him the second-highest paid player in the NFL. It’s common for players to get extensions heading into their final year so the team avoids the possibility of them becoming free agents and the player has his future secured, and it’s been thought all along Seattle would try to get something done with Wilson this summer. Wilson, though, told the team in January he wanted to have it done by April 15, which is when the Seahawks begin their official (though mostly voluntary) offseason training program. One reason Wilson set a deadline is that it worked in 2015, when Wilson wanted a new contract by the start of training camp — the two sides got it done the night before camp opened and Wilson signed it on the first day of practice. 1. He wanted to avoid an offseason of discussion and conjecture about his contract, as happened last time. 2. His side doesn’t think the QB market is going to change over the next few months, so whatever the Seahawks could offer in July they can offer now, so why wait? Q: How close are the two sides to a deal? A: While there has been communication between the two sides of late, the leak of the news of a deadline this week doesn’t appear to have — as yet, anyway — resulted in any significant breakthroughs in negotiations. Conversely, it never takes much for there to suddenly be progress and deadlines tend to spur action, which also surely factored in to the setting of a deadline, and an earlier one than in the past. Wilson’s camp knows that the franchise tag is a far more realistic possibility than last time, while the Seahawks know Wilson has more leverage this time than in 2015, when he had yet to make really substantial money and it was clear he was going to want to not play hardball too much to assure he got a life-making contract before setting foot on the field again in 2015. But this time, each side could play more of a waiting game. One reason for setting an earlier deadline — from Wilson’s standpoint, anyway — is to get the Seahawks to lay their cards on the table and maybe reveal if they really are just waiting to play the franchise tag game. If so, Wilson’s side would likely rather know that now than spend the rest of the spring and summer wondering. Q: What are the major sticking points? A: Last time, Wilson got a deal that slid right behind Aaron Rodgers’ contract as the second-highest paid player in the NFL. This time around, Wilson figures to want some sort of a benchmark, be it being the highest-paid player in the NFL (meaning $34-35 million per year) or the highest guarantee at signing ($100 million or so). Speculation has grown of late that the two sides could reach a compromise of a three-year deal worth $100 million guaranteed that could satisfy Wilson in giving him a contract that sets new precedents while also not locking in either side for too long — Wilson could again hit free agency when he was 33, for instance, and three years would also coincide with what is left on head coach Pete Carroll’s contract. Guaranteed money was regarded as one of the major sticking points last time and it could be again due to a Seahawks’ recent precedent of not guaranteeing salaries beyond the first year of the contract (as former NFL agent Joel Corry, who now writes for CBSSportsline.com, noted this week, the last time the Seahawks did that was with Percy Harvin in 2013). Also a potential complication is that the league’s collective bargaining agreement runs out after the 2020 season, meaning there’s some guesswork involved in what salary cap numbers will be — one reason a three-year deal might make more sense than four or five. There’s also some unknown in how high the revenues might increase if the NFL gets added money from its increasing embrace of gambling, yet another reason a shorter, but fully guaranteed, deal could make sense — or simply playing the franchise tag game. Q: What happens if no deal is reached April 15? A: Wilson won’t hold out. But the strong implication is that he will then tell the team he doesn’t want to negotiate again until after the 2019 season. But even at that, the Seahawks could just franchise him next February — guaranteeing a salary of roughly $30.6 million for 2020 — with the two sides able to continue to negotiate. Seattle could use the tag again in 2021 at just over $35 million. That would assure Wilson being in place for as long as the rest of Carroll’s contract, which ends when Carroll is 70, and if that happened Wilson could become a free agent then — a third tag in 2022, which would be in the $52 million range, is unlikely. And who knows? Maybe that’s the Seahawks’ plan here, thinking only as long as they know for sure that Carroll is around (the Seahawks have yet to make a significant long-term player signing since Jody Allen took over as the head of the trust owning the team following Paul Allen’s death last October). And because that would allow Wilson to become a free agent at 33, he might be OK with that, as well. Q: Is a trade really possible? A: It sort of seems unthinkable that a team would trade a franchise quarterback right in the prime of his career due solely to something such as not wanting to guarantee the second year of his contract or something. But if no deal is reached by April 15, nothing can be ruled out. It didn’t escape the notice of Wilson’s camp that the Seahawks were interested in Patrick Mahomes in 2017 or attended Josh Allen’s pro day a year ago. And the Seahawks showed little hesitation in moving on from the likes of Richard Sherman and Earl Thomas, Carroll seeming to eagerly embrace the challenge of building a new secondary. As a few league sources said this week, the run-up to the NFL draft April 25 will be especially intriguing if Wilson and the Seahawks do not have a deal by April 15. Still, the Seahawks would undoubtedly drive a really hard bargain — would even two first-round picks be enough? — and would probably need a deal that would assure a potentially elite-level QB in return. At 67, Carroll doesn’t seem inclined to want to rebuild now. 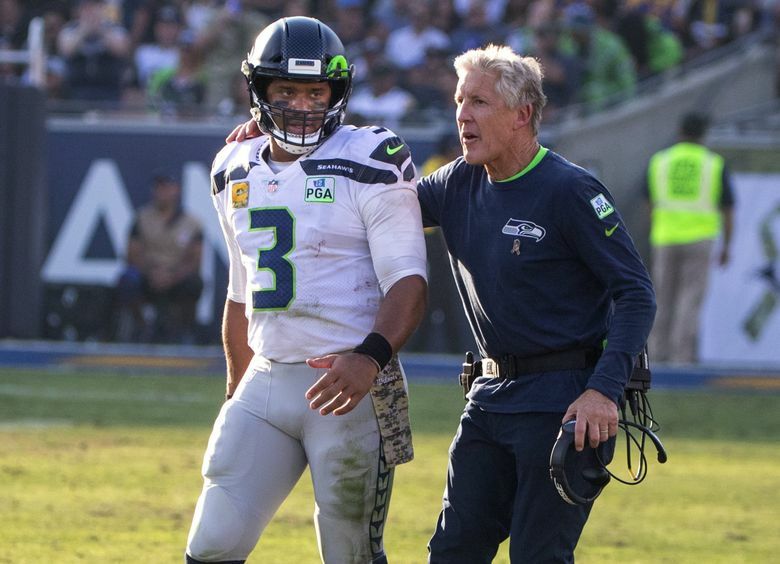 A: That still seems to be anyone’s guess, making April a much more suspenseful month for the Seahawks’ future than anyone could have imagined when the week began.